Accelerated Commerce Tools (ACT) for AEM brings the full AEM authoring experience to a commerce implementation. The top priorities of an AEM and commerce implementation are typically getting the systems to work as one and ensuring that the customer experience is perfect. As a result, the workflow experience for employees who are authoring, marketing, and performing internal activities within the platform often takes a back seat. Here’s a deep-dive into how it works. ACT uses real-time commerce API’s to present commerce data within the AEM authoring experience. The commerce interactions can be handled by Adobe’s CIF or a customer service layer. By utilizing extended Adobe Experience DTO’s, all of ACT’s functionality becomes available. All product detail pages (PDP) are dynamic, so a single page can render categories or a full catalog of products. Using selectors, each product’s variation of the page is cached within the dispatcher, just as if it was a static page within AEM. Single AEM page utilizes sling selectors to generate any product’s detail page. Components can be ordered or swapped to generate the desired customer experience on the PDP. 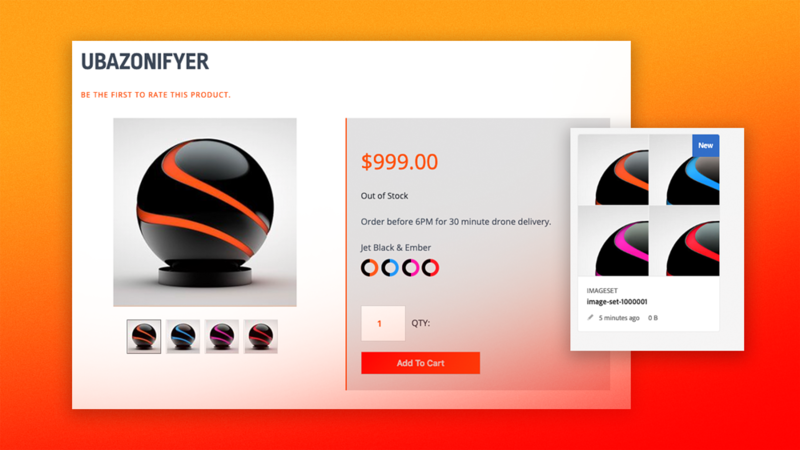 Static content components can be added for display on all products for a catalog category. Marketing product data can be authored from the PDP. An AEM dialog opens with the commerce system’s product data with a blank field for the marketing override. The marketing data is saved in real-time to the product within the commerce system for global use. Open an AEM authoring dialog, see the commerce information and author marketing data. On Save AEM sends the data to the commerce system. Finally, the author can add marketing content at the product family or variant level from the dynamic PDP. One or more of these marketing locations can exist on a PDP. The marketing data is saved within AEM and displayed when the appropriate products are displayed. 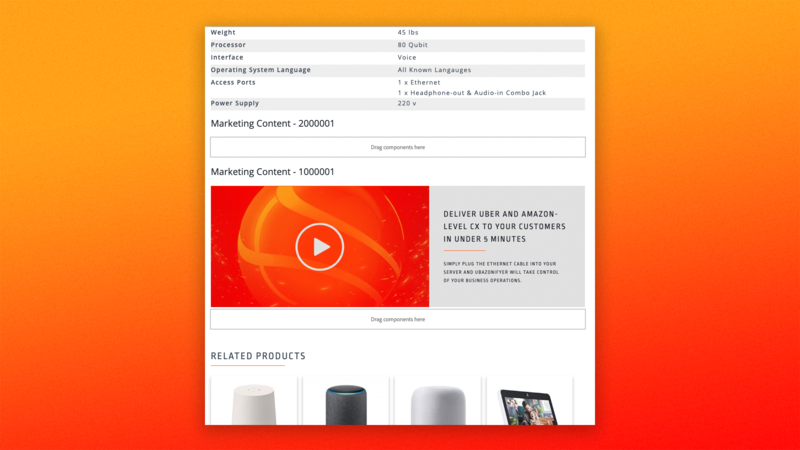 Marketing content slots available on the dynamic PDP. Allowing for one-to-one marketing of a product or product family. A common challenge with authoring is how to control views and data across multiple pages. Utilizing design or standard authoring modes leaves gaps or creates duplication of work across templates or pages. Using product tile display configurations, product views are controlled from a central location. One or more product views can be configured for a site. Each view is defined at a page level and inherits down to subpages. 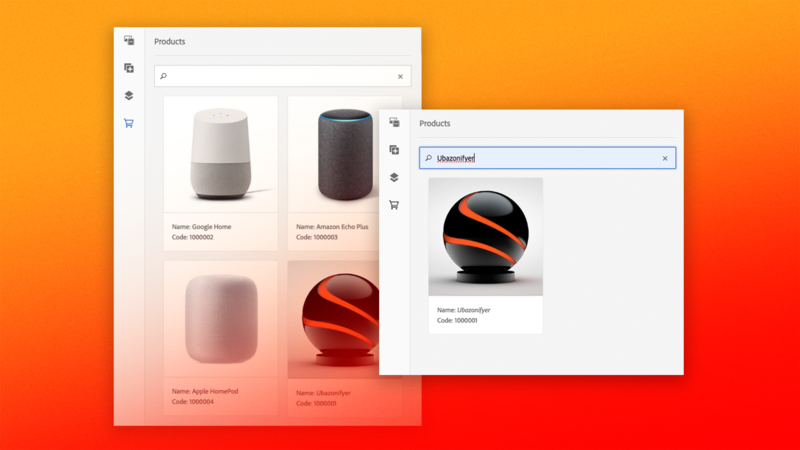 Any product tile component, product list, product search or carousel will display uniformly. The views are defined from touch UI screen that can be secured to site owners or administrators. Centrally control product data display using the AEM page hierarchy. Select the commerce product data to display including order. A product finder is built into AEM with free text search. When an author searches for a product it executes a real-time product search from the commerce system. The resulting product set can be dragged and dropped on any product-enabled components. The product’s SKU is saved and displayed in real-time to ensure the latest product data is always shown to the customer. Search the commerce system within AEM to find products. Drag and drop the product onto AEM pages. Integrated digital asset management syndicates your assets like images, documents, media and sets to the commerce system from AEM. Using our DAM integration framework asset metadata, URL and binaries can be syndicated to a commerce system or PIM for inclusion within the product’s data. It creates a single source for all assets within Adobe Assets or Dynamic Media to be utilized across marketing channels. Dynamic Media sets can be created and used on PDP’s all within AEM. Utilize Dynamic Media sets on PDP pages. Create the set within AEM and it appears on the PDP with no commerce data update. ACT brings AEM and commerce together for marketers, solving common challenges to give marketers the features and functionality expected from AEM in the context of commerce. Book a demo to learn more here.